The viral website ShipYourEnemiesGlitter is struggling. Thanks to the insane popularity that his service had garnered – to mail your enemies copious amounts of glitter – founder Mathew Carpenter is struggling. With 2,200 orders coming in within a few hours, according to TechCrunch, the one man show has decided to take down the order form and is working to fulfill the backlog of orders. That’s when shipyourenemiesglitter.asia came about. 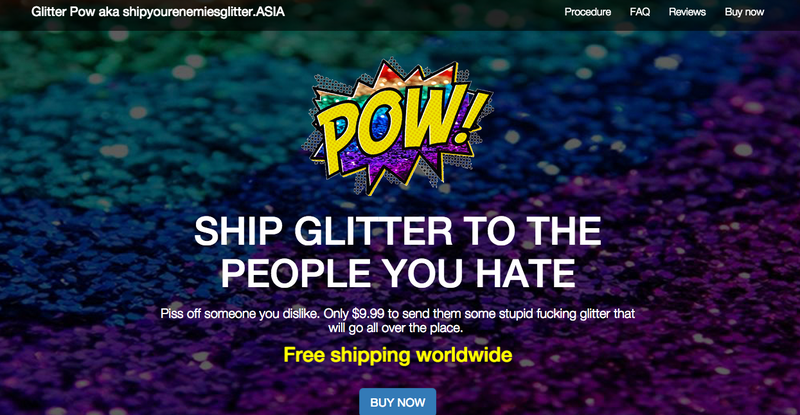 Started by a Thomas Tan, the website is dedicated to do exactly what Carpenter aimed to do – ship glitter to people you hate. With a slight increase in price US$9.99 instead of US$8.21 of the .COM site, the website is offering free shipping worldwide, and promises that it has 10kg of glitter and 10,000 envelopes ready to send at your command. Glitter bombs are sent out within a day or two. Tan has also told e27 that he is not working alone. With a team of what he calls “three adept glove-wearing superheroes”, they are ready to conquer Asia. With envelopes and glitter easily bought in bulk at an insanely low price, it’s possible that this company is going to make some serious money. Perhaps enough to eventually buy over the main shipyourenemiesglitter.com site, which is being put on auction on Flippa at a current going price of US$70,500.